I’m sitting in Moondust’s cabin with the south easter blowing hard and rain pattering on the windows, which is very welcome in the current drought. Looking back on the past year of frantic activity it is hard to believe that we are now counting the days before our departure! We hope to set sail early January, but the nature of sailing is such that it is impossible to set a fixed date and time. In the year since we took ownership of Moondust we have worked far harder than we have played. In fact, technical matters kept us off the water long enough for a mother rock pigeon to find her way into our mainsail stack pack, lay her eggs and hatch the chicks, only to have me haul them out by the handful whilst searching for the reefing lines when we finally went out again. On our return to the dock, both parents were clearly distraught at the loss of their chicks, which put us in a quandary – take them to World of Birds… or what? This was resolved the next day when Hendrik at the sanctuary informed me that they couldn’t accept birds due to bird flu. So, a carved-up wine box on our foredeck supplanted their home in the mainsail and their parents returned to feed them until they flew the nest a few weeks later. In the meanwhile we kept a low profile with the other yachties, as none of them would have welcomed two more pigeons messing on their boats! Our baby rock pigeons, in various stages, and the nest I made from a wine box. Whilst Moondust was touted as an ‘ocean ready’ vessel, much of that readiness only prepared her for local cruising. 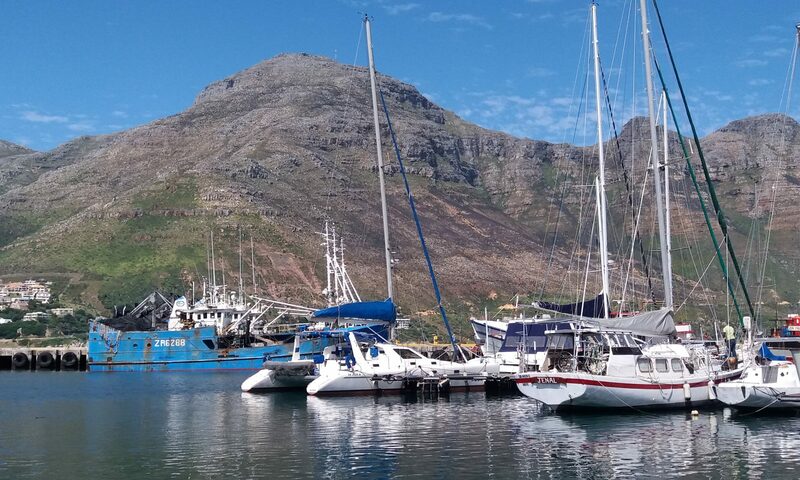 The South African coast is inhospitable, with relatively few harbours in which to take refuge when the weather turns foul and even fewer places where a yacht may be safely anchored outside a formal marina. So it seems that many sailors only require their craft to be sufficiently prepared to dash between sheltered marinas when they get a favourable weather window. And as marine spares are readily available in Cape Town or Durban, items are usually only replaced when they fail rather than to pre-empt failure in far flung places. During the past year we’ve tried to ensure the essentials on Moondust are sound and have acquired indispensable spares to take with us. On a cruising yacht, anchoring your home securely to the sea bed is a safety fundamental, which again, is not often required around South Africa. Moondust’s previous owner had assured me that the anchor windlass worked and surely, it pulled the anchor chain up and down for about six brief excursions before grinding to a halt and refusing to budge. Clearly Moondust had been mostly marina berthed, her crew seldom needing to drop the anchor. This electric winch is heavy and just unbolting it and getting it out of the cramped anchor locker was very difficult. Once out, I strapped it onto my motorcycle and went to see if it could be resuscitated, sadly without success. After delving into the technical intricacies of windlasses I purchased a new one and then spent about three months of Tuesdays, when I had some strong helping hands, to modify the boat and the stainless steel fitment case to accommodate it. Finally after extending the heavy DC cables, I fired up the circuit breaker and to my great satisfaction, it operated perfectly. I had by now begun to realise that the previous owner had spent generously on major items including a 3000 watt inverter and fancy inlaid wood for a new saloon floor, but had been less fastidious with his routine maintenance. In fact, now, a year later, with the double mattress removed from one of the rear cabins, which is now fully dedicated to crates of tools and supplies, I reflect on my earlier naivety, prior to sailing down from Durban. Then I had felt reassured when Moondust’s small, solitary tool box with its rusty contents was eventually found in the former owner’s garage. So followed many months of hard work on Moondust. My smart phone took on new importance as I took pictures of most of the jobs before beginning, to ensure I could re-wire or re-assemble the item or get the right spares. My multi meter, having long sat idle at home, was gradually put to use as I learnt to diagnose electrical problems. It’s impossible to fit a self-steering device to a catamaran, and as it’s also well nigh impossible for two people to enjoy steering a boat across the vast breadth of an ocean, our autopilot is very important. My request for spares for our ageing ST 5000 was laughed at by the Raymarine dealer. ‘Not possible, fit a modern pilot’. The usual research followed, as did quotes from various sources which varied widely. I finally resolved to buy the new unit via our boat broker and fit it myself. Apart from the hydraulic arrangements to fit a new pump into the existing system, it turned out that the rest was just a matter of removing the old system hardware and affixing the various new control units onto suitable bulkheads. Connecting the old and new cables was a bit more confusing, but Francois from the local dealership came on board for half an hour and showed me what to do. About seven trips later to various hydraulic outlets finally got me all the correct fittings and after doing the set up procedure, it seemed to work. Getting to grips with other unfamiliar jobs such as the saildrives and desalinator on Moondust usually followed research which began to dissipate the murk of ignorance and enabled me to summon the mental energy to get down to them. Communication on the trip is another complicated issue. It’s easy enough to buy foreign sim cards for use when close to cell phone towers, but receiving weather reports out at sea is a lot more complex. For that reason we bought a second hand Icom 710 marine radio and Karin signed up for a five day high frequency radio course which, predictably, she passed with flying colours. After installing the radio, antenna and tuner, yet another challenging job, we fired up the radio, only to find that we could only pick up the local 567 Cape Talk channel, as all marine channels had been deleted by the ham operator who sold it to us. The radio is currently being reprogrammed to include these and then we still have to ensure that we can connect it to the Pactor modem and computer to receive weather faxes. Instead of using a satellite phone as our back-up for emergency communication we decided to buy an InReach Explorer. Apart from serving as an extra GPS, it also provides tracking, SOS and SMS functions from anywhere on earth. Its weather reports however are inadequate for our purposes, lacking synoptic charts. Solving Moondust’s thirst for electric power had occupied a great deal of my time, firstly working out how much energy she was likely to need to run all the electrical equipment on board – which meant just about everything apart from the manual winches, the diesel engines and the gas stove. One of Karin’s work associates, Renzo Blaza, owns a solar installation business in Johannesburg and kindly spent hours corresponding on the subject. In time we decided on the equipment needed and Renzo loaded his van and brought it all to Hout Bay. We spent a weekend installing the batteries and related control equipment and our mantra – ‘There is no quick and easy job on a boat’ held true when it took eight hours to pull cables through eight metres of electrical conduit. Renzo and Pete installing the new battery bank. Now, with a brand new battery bank to care for, but no supports on which to install the solar panels, I had to connect Moondust to shore power and buy a battery charger to keep them topped up. Prior to that I had to replace the galvanic diode isolator, necessary to prevent the aluminium saildrive casings being corroded to powder by stray electric currents travelling down the mains earth wire. Expecting to spend much of our time ‘off the grid’ and away from the shore based power I wanted to plan also for cloudy periods when solar charging would be less effective. Moondust has two 190 amp battery charging alternators, neither of which worked. So I stripped them out, had them re-wired and serviced and got the cranking battery alternators done at the same time. To supply and store our energy needs we bought three eighty kilo batteries and, to recharge our daily power usage from ‘green’ sources, this required the construction of an elaborate and strong framework at the rear of the boat to support sufficient solar panels. Research on this project started in March 2017, the final design only being concluded in August, largely thanks to the experienced and generous help of Ken Pollard, eminent local sailor and circumnavigator of ten years in his pristine aluminium sloop, Fastforward. To get the structure built, at Ken’s recommendation, I contacted the Jacobs family business and Zaid proved to be a very reasonable and excellent craftsman. In the meanwhile we prepared the house for a long term unfurnished rental; repairing skirting boards, filling cracks and painting walls. Karin had researched removal and storage options and we chose Elliot Mobility which proved to be an excellent choice. We had been lucky to find a young couple and baby daughter who wanted an unfurnished rental for three or four years prior to emigrating. So, a week before they moved in at the end of September, we relocated onto Moondust as full time ‘live boards’. Then we scrubbed and cleaned every inch of the interior of the house to ensure that it was spotless. In the few months before moving out we had been selling off items that we no longer needed over Gumtree or OLX and were grateful for the substantial boost this gave the boat fund. Another step in freeing us from land, was selling Karin’s car and my motorbike. Visitors Lineke and Isabella were very keen to learn about about sailing! We immediately settled in and loved living on board Moondust! The Hout Bay harbour setting is beautiful and one of the joys of living aboard is daily seeing the seals playing with their food. We worked on the remaining jobs, one of which meant another trip up the mast. I examined each piece of rigging as I ascended and near the masthead was dismayed to discover that one of the metal swages used to crimp the rigging wire to the mast attachment had a tiny crack. I had been pleasantly surprised that an earlier survey gave the rig a clean bill of health. However, now, whilst both main shrouds were being replaced, several other tiny cracks were found in the diamond stays and other critical supports. In short we had to install an entirely new rig!! In the meanwhile, following a ‘dry fit’ on Moondust, Zaid completed the solar support and arrived with his team to fit it. Karin and I were thrilled with the result. The solar array provided excellent security to the formerly unprotected after deck and blended in beautifully, resulting in compliments and envious glances from many in the marina. Not only do we now have the most expensive washing line support in Hout Bay, but the four large panels pump out so much energy that we have been living off the grid ever since. We are able to heat up our shower water via the inverter and even bought ourselves a bread maker, which will be fantastic during our ocean crossings. One night I awoke to the sound of a newly installed bilge pump operating repeatedly in the heads (bathroom). Bilge pumps only activate when the water level rises, so I roused myself, as a good captain should, to investigate. There was as usual, some water in the bilge which the pump dutifully expelled periodically, up and out of the pipe. It then shut off only to recommence pumping a short while later as the level rose again. There certainly was no crisis, but who knew what could happen during several hours of sleep. So after numerous perambulations back and forth from bed I felt I should get to the bottom of this – were we in process of slowly sinking or not? Karin had filled the water tank earlier in the evening and, keen to establish whether the cause of the problem was salt or fresh water, I reluctantly dipped in a finger, tasted, spat it out and vigorously rinsed my mouth. Findings inconclusive! Brack water, neither salty nor fresh and certainly not to be swallowed as it was doubtless filled with the residue of many years of toilet and shower overflows. I was astounded to see two tiny fish swimming around, but after further scrutiny it was apparent that we were in no danger, so I switched off the pump. I mumbled something to Karin about an article I had been reading entitled ‘The Secret Life of Bilge Pumps’ and mentioned that there were fish swimming in the bilges. I slept peacefully for the little that remained of the night but not so Karin, who lay wondering about the ‘secrets of the bilges’ and puzzled about the fish down there. She could not understand how I could be so casual about it! Her first question the next morning was “How big are the fish in the bilge?” We had a good laugh as she had visualised pan size fish whilst I had seen minuscule things that looked like fish. In amongst all the other jobs we found time to paint the anti-slip areas of the deck. Sailing twice a week for the last few months has improved our skills tremendously, so we are now comfortable with sailing Moondust with just the two of us on board. Unfortunately we have only managed one overnight sail, when both Karin and a guest crew member, who needed sea miles for his skipper’s ticket, were both mandown with seasickness. However, we since have found that the tablets prescribed for the nausea experienced by pregnant women and chemotherapy patients also remedy Karin’s sickness. So now, having owned Moondust for 14 months, apart from re-programming the HF radio marine channels and learning how to receive weather files we only have one other important task to complete prior to setting sail. The hydraulic steering ram seals are bypassing oil, so two more are on order from Canada with scheduled arrival just after Christmas. These are supposedly identical to those presently installed, and swapping them out should be simple. Watch this space……..! The first loaf of bread baked on board Moondust! Thank you. That was very informative. After all that, I think I’ll stay on two or four wheels thank you. But I wish you ‘plain sailing”, and look forward to your stories and pictures. Greg, I promise you, travelling on two or four wheels is significantly less complicated than sailing. One has to acquire a wide skills set to be able to live on and travel by boat. But it is also huge fun and far more luxurious than travelling Africa in our Hilux with a rooftop tent. Great update and as time for you guys to set sail draws closer there must be a thousand and one things to think of. Safe travels on what will be an adventure of a lifetime. Thanks Peter. You don’t want to see our To-do lists over the past year! There indeed are a million and one things to think of. All the best. Thank you so much for adding us on your distribution list! Can’t wait for the updates as you progrrss. Happy sailing!!!! Thanks. Hope you’ll come visit us! Sal baie graag jul volg op die blog. Afrika so geniet deur jul oë en kan ek ‘n wêreldvaart beleef! Wens jul ‘n wonderlike ondervinding en voorspoedige reis toe. Geseënde Kersfees. Baie dankie Maritha! Wens jul ook ‘n baie Geseënde Kersfees en voorspoedige en gesonde 2018 toe. Kom kuier gerus vir ons. So interessant. Gaan julle volg. Sou ook my droom gewees het as ek nie so ‘n bangbroek was nie. Verslind boeke oor seiljagvaarte. Voorspoed en seënwense. Why didn’t you pop in?! Somewhat jealous of all the fabulous places you will be visiting and the peace and quiet of being at sea. Wishing you guys a fabulous trip, safe travels and we hope to join you for a few days of sailing. We’re looking forward to you and Renzo joining us, so he can at least also enjoy some of his hard work on Moondust. Loved your first blog, Pete what a mission you and Karin had to go through but it will be well worth it once you are out there in the open sea! Bon Voyage looking forward to the blogs! Thanks Les. We are really looking forward to setting off with the next spell of decent weather.